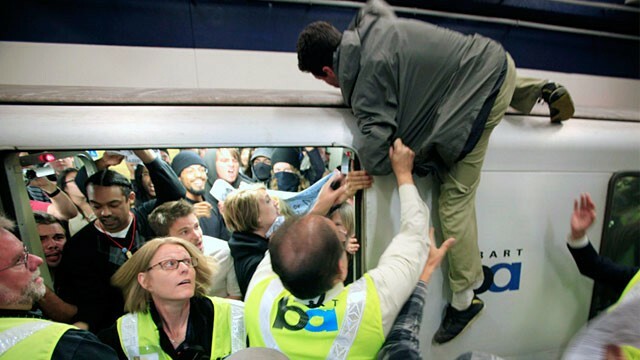 There’s been a lot of hoopla about the BART police disabling the cell phone system in the BART stations in order to disrupt a planned civic action inside stations against BART. BART said from the beginning that they would allow protests outside the paid fare area but not inside due to safety concerns. I think the formula goes like so: crowded station + angry protesters + platform edges + moving trains + 3rd rails = danger. I see that bit about freedom of speech. And I also see that bit about assembling peaceably. What do you see? Protest all you want. Don’t do it in train stations. I see a dude who want’s to ride a train but doesn’t want to be packed in with all the wimps inside. I think it’s ridiculous that you can’t see when the next train is coming until you go into the paid area. What if the train isn’t coming for 10 or 15 minutes and I want to get in some protesting, then enter the paid area in time to catch my train? BART needs to put train arrival info OUTSIDE the paid area. The moral of this story is: you can’t trust the system! Oh no! Wladyslaw is using the Chewbacca defense! We don’t stand a chance!